A La Niña pattern this year meant stormier weather for the 2010-2011 season bringing cool ocean temperatures to the Pacific Northwest. The Grow Project and the Bulkhead Urban Agriculture Lab began germinating long before the first seeds were sown and ended long after the harvesting of carrots, mustards greens, pumpkins, and other crops. A concatenation of performance art, sculpture, social practice and still unnamed forms of emergent creativity, Grow was a year-long event that took up sustainability and knowledge exchange as a fluid process of gardening, workshops, walks and other public events. With its primary focus on ideas engendered through sociability and community, it is not surprising that artist Holly Schmidt invited Duane Elverum and myself to discuss her research and plans: we share similar interests in creative pedagogy and considerations of ecological issues through dialogue and practice. Not far from the project site, the last remaining section of undeveloped seawall situated on the periphery of the Olympic Village in South East False Creek, Schmidt’s studio was an accommodating environment that set the scene for an expansive, and ongoing conversation. At the time of our meeting, she had already spent a fair amount of time working with the City to secure this parcel of land for a temporary art occupation. Proceeding from her cross-disciplinary practice, Schmidt solicited ideas that would further open up the project to community encounters. Often referred to as the Bulkhead, the fallow patch of land posed some challenges for the artist’s vision of an unconventional social space for the sharing of information and practices whether through workshops, walks or volunteer participation in a temporary garden. Still nascent in form we considered the ecology of the site, trying to imagine its exact location and the state of its dereliction. Discussion turned to strategies for gardening in a post-industrial landscape including the challenges of growing food without planting anything directly in the ground and in the absence of immediate access to a safe, potable water supply. From its inception it was clear that Grow would be an innovative artwork through its blurring of disciplinary boundaries and provocative engagement with community and public space. The simultaneous engagement and suggested critique of contemporary issues around food, urbanization, and everyday life made for a timely encounter.1 To this end, Schmidt talked about strategies for how she would grow food in large industrial bags previously used to ship bulk sugar and the resources she was sourcing for acquiring donated seeds, plants, earth, etc. Drawing on her training as an artist and an educator, it was clear even at this early stage that Grow would bear witness to a public display of reciprocity and traditional knowledge exchange. The evening ended with a shared sense of anticipation for this extended art work invested as it is in community engagement, sustainability, gardening, food security and emergent forms of dialogue. Another weekend of below-average temperatures made this the coldest April and May on record for Metro Vancouver. 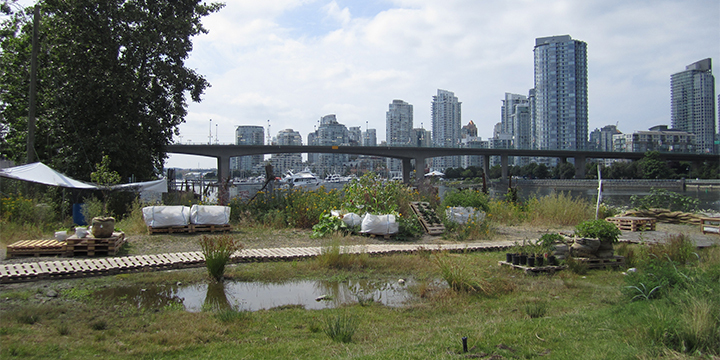 On May 7, 2011 Grow, the art and urban agriculture project was launched with Exploring Sustainability and Urban Agriculture, a walking dialogue through South East False Creek. Although it began with overcast skies, which then descended into a rainy afternoon, the experience was enlightening. Participants shared their thoughts on city planning, the implications for using particular construction materials and the habitation of the area, what had been destroyed and what was in the process of evolving and regenerating. This discussion was followed by approximately fifteen of us traipsing on the now wet bulkhead site and drawing diagrams on increasingly soggy paper designating on one map the “strong center” or locations that shouldn’t be disturbed and on another an area that needed help, that was in fact, calling out for repair. The event concluded with a passionate and informed exchange on current issues in landscape architecture and design. Scheduled walks continued through the spring, summer and fall nurturing peripatetic dialogue on sustainable design that provided a platform for collaborative learning. Later in the month of May with the wet soil conditions unabated, the Vancouver Design Nerds and some master gardeners joined Schmidt for a workshop at the local community center that explored strategies for growing food in the urban environment. I was unable to attend but was thrilled to see the pocket gardens that were fabricated during this gathering installed along the chain link fence near the Grow project site. Biking along the False Creek south seawall throughout the summer, orange, yellow and red nasturtiums poked their way out of these miniature conical gardens. As a collective experimentation in urban space, local residents, dog walkers, tourists and cyclists alike would stop and enjoy the flowers, talk with volunteers and artists on the site and inquire as to what exactly was blossoming at this strange intersection. Later in December that year, while reading Wendell Berry’s book Bringing it to the Table: on farming and food, I was struck by the author’s statement that “ […] an agriculture using nature, including human nature, as its measure would approach the world in the manner of a conversationalist”2 and was reminded of the ongoing dialogue that was the very essence of the Grow project. Rather than mere consumers, participants witnessed, indeed engaged with growing and eating as contingent agricultural and social experiences that remind us of our fundamental and embodied relationality with the world we inhabit. On the last day of summer Environment Canada issued a heavy rainfall warning for the entire West Coast of B.C., ending what may be one of the worst summer in years. By the beginning of July with the sun only starting to make a regular appearance Grow had fully installed itself on the site. Slipping into the local flora and fauna, and grafting some of its own, a composition of elements lay down its roots and rhythms with living organisms coming together in a sociable conversation. On July 24 I attended the Vancouver Henhouse workshop and learned some of the basics in the proper care and keeping of small urban flocks of hens. The “Vancooper” was installed at the Lab on the previous day so that workshop leader Duncan Martin could demonstrate how easy the prospect of fresh eggs can be. I was delighted to be surrounded by participants who were clearly invested in these innovative initiatives and engaging the challenging relations between living beings. Unfortunately I missed Chloe Bennett’s discussion on mason bee habitat and the proper methods of building a mason bee home in the city. The current degraded state of bee colonies (CCD or colony collapse disorder) is such an important issue particularly as bees pollinate more than one third of all food crops. Put another way, every third bite is brought to us by bees.3 Fortunately, my fascination for insects was somewhat appeased when I returned on August 19 for the Ladybug’s Lunch with Maria Keating, a biological control consultant who shared her extensive knowledge of backyard ecosystems. Grow’s concern for establishing informal communities came into focus and here its members included pollinators, native predators and companion planting. I was particularly taken with the carnivorous flora, what Darwin in 1875 called insectivorous plants that trap and consume insects and promote environmental stewardship. Throughout the summer Grow demonstrated its capacity for encouraging affective experiences. In a combination of durational lab work and field science, the study of human ethos with its integration of evolution, ecology and behavioral processes, took up residence. “ [This ethological] approach is no less valid for us, for human beings, than for animals, because no one knows ahead of time the affects one is capable of: it is a long affair of experimentation, requiring lasting prudence.”4 With its extended installation from May 1 to November 30 2011, the Grow garden carried its audience of participants through time in the daily experience of its experimental residency. Precisely because there was no clearly elaborated sense of the whole; because engaging with the project was a contingent experience that changed daily and with the seasons, Grow offered opportunities for strong embodied connections as well as affective aesthetic pleasure and displeasure. Apparently one fellow complained about what he perceived as the site’s disarray and lack of conventional garden aesthetics. According to philosopher Gilles Deleuze “The important thing is to understand life, each living individuality, not as a form, or a development of form, but as a complex relation between different velocities, between deceleration and acceleration of particles.”5 This is an important reminder of our multiple relationships with a given site, artwork, people, plants and other living organisms. While I attended workshops, read reviews, checked the blog and regularly biked past Grow, the occupation itself was evidence of the proximity between art and life. By Sept 8 the summer was in full swing with the garden producing an abundance of corn, zucchini, pumpkins, cucumbers, radishes, kale, beets, mustard greens, green beans, carrots, tomatoes, rosemary, mint, fennel, dill, sage, lemon verbena, oregano, basil, chives and of course the delicious and colourful nasturtiums. On Oct 5 as part of the annual autumnal art event called Swarm, the Grow project offered 1 metre to 100 mile organic tastings prepared by urban farmer and wild forager Alexander McNaughton. In the middle of the site, at one of the strong centers left as an open space for congregating, we feasted on heirloom tomatoes, tomatillos wrapped in papery husks, maroon coloured carrots and handmade artisan cheese. What remains are memories of a crepuscular sky, intensive encounters and admittedly anonymous vegetables making acquaintance with my taste buds. How could one not be affected by the local harvest and sociable twilight? September brought balmy warm weather to Vancouver. The long range forecast showed sunshine lasting well into the month with temperatures into the 20’s. By Oct 22 the celestial, terrestrial and subterranean movements of the seasons were wending their way through harvest to the fallow sleepiness of winter with the final Grow event. Bringing seeds gleaned from my own backyard garden and neatly packaged in homemade envelopes, I attended the Grow Seed Exchange at the local community centre where some rather robust arugula seeds were swapped for mint, kale, mustard, cilantro, dill and lupin seeds. In addition to sowing them in my garden, I was instructed to plant these seeds around Vancouver to ensure that Grow keeps germinating. Now, as spring returns once again and the quiescent life in these seeds begins to emerge, Grow returns as a porous physical and philosophical ecosystem. The project, an encounter with informal communities, challenges our thinking about aesthetics, gardening, learning, local ecology and conversation. Not unlike a master gardener, Schmidt sows the possibility of emergence by opening a space for its expressive potential without knowing in advance what will be elicited and how the project itself might evolve. And that, in a way, is what Grow realized in its yearlong habitation experienced through the material agency of weather, hours of daylight and local ecology.